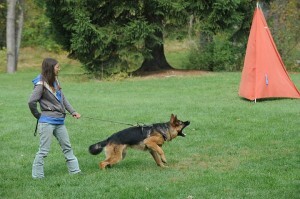 Schutzhund, now known as IPO ( I’m sure someday I will get used to calling it IPO) is my personal dog training passion. 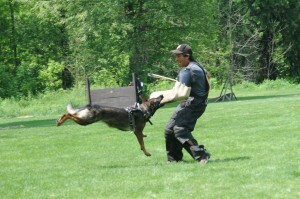 For an in-depth description of Schutzhund, please follow the link at the bottom of this page. For now, let’s just say Schutzhund is an all breed dog sport, and German Shepherd Dog breeding test (and sport) consisting of three phases; Tracking, Obedience, Protection. I personally use schutzhund as a breed test, as well as a hobby/sport for fun. Not every dog has the genetic make up to be able to participate in Schutzhund. Don’t worry though, there are a zillion other fun things you can do with such a dog. Not even every German Shepherd dog has the potential to do protection training, (they should, but that is another subject entirely, let me just say this, If you are wanting to get started in Schutzhund and DON’T already have a dog, please do some research or let me help you find a dog) If you do have a dog, and are interested in Schutzhund, we can evaluate your dog and be honest about whether he/she has potential to do Schutzhund training, whether you are interested in titling or not. 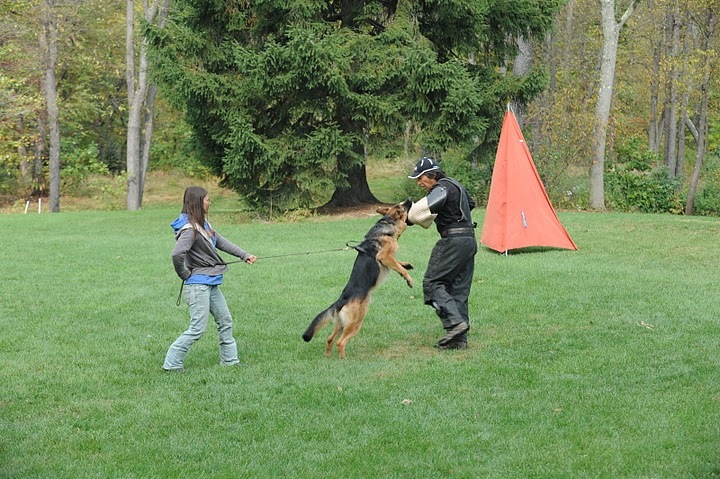 A common misconception about Schutzhund and Protection training, is that it will make your dog overly aggressive and not safe to be around. This couldn’t be further from the truth. If you met my protection trained dogs on the street, you would never know they had any protection training, they are not aggressive towards strangers, are very approachable, and would never bite someone without cause or being told to do so. 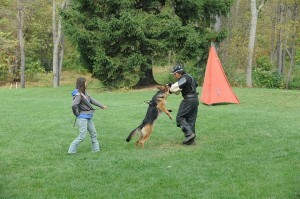 Personal protection training is different than schutzhund, and many people think they are one in the same. 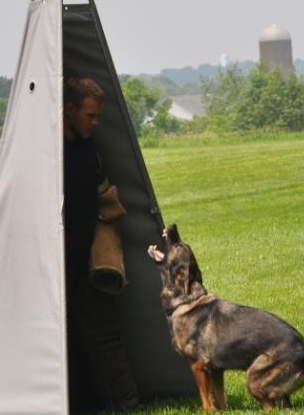 Schutzhund does have protection training involved with it, yes, but it also have many other aspects, and even the protection is different than what most people think of when talking about a protection trained dog. In my experience, most people thinking about protection training for their dog, want to have a dog that will alert (bark) on command, apprehend (bite) if needed, and out (release) on command. Along with very solid obedience. I get a lot of requests from people wanting to do protection with a dog they already have. I am extremely selective as to what type of dogs I will recommend for protection training. You can contact us for an evaluation of your dog for free to see whether they are of the correct temperament for protection training. Do NOT feel bad if we say no, they are not. There are way more dogs not suited for protection training, than ones that are suited for it. Sometimes we can tell you right away, no they are not suited, or yes they are suited. Sometimes it’s not so clear, and we will be honest and tell you we can start the training, but no guarantees. You can’t always tell right away with how a dog will hold up in different situations with different stressors, etc. Sometimes a dog might not show any aptitude , but once they mature or are exposed to more, they flourish. So, in other words, it is not always black and white, but either way, we will give you our honest opinion. Once again, if you are interested in this type of training, and do not have a dog already, please do research on where you get your dog, we are happy to help! Just keep in mind, just because you get a certain breed, it does not guarantee they will be able to pursue this training.